Alizée Benoit, an American painter working for the Works Progress Administration (WPA), vanishes in New York City in 1940. 70 years later, her great-niece endeavors to find out. This novel belongs to the 'brainy thriller' subgenre, in the vein of Dan Brown and Michael Crichton’s work. But it has more emotional ballast and is more skillfully written than what one customarily finds. Novels are often engaging while being read then quickly forgotten, but The Muralist leads to a desire for more: To learn about the abstract expressionists, to see paint on canvas up close and personal, and to be aware of the world’s current refugee crisis in hopes that the history recounted in Ms. Shapiro’s book will never be repeated. 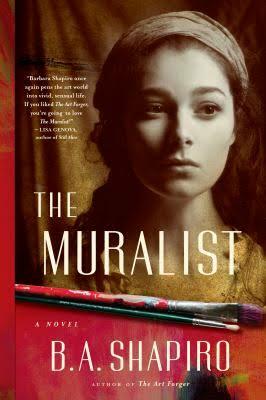 Shapiro’s plotting is deft, and the anonymous paintings and Alizée’s disappearance add mystery and intrigue to a tale...But The Muralist, at times, bogs down when Shapiro overworks clichés and resorts to pedestrian phrasing and stiff dialogue. What did you think of The Muralist?